The Doctor of Research in Management (DRM) is a doctoral level program in management which emphasizes the development of knowledge in management by combining the elements of science, best practices, and use of Information and Communication Technology (ICT). Doctor of Research in Management – Strategy and Growth (DRM-SG) dwells into the root of the role of strategy in management: defining organization’s positioning, making trade offs, and forging fit among activities. DRM SG is more than just an Executive Development Program. While EDP focuses more on practical managerial skills which can directly be applied on day to day professional activities, DRM SG emphasizes the balance between rich, rigorous research in management with relevant, significant enhancement of business best practices through appropriate use of ICT for competitive advantage. With support from BINUS’ strong IT infrastructure, DRM SG conducts virtual coaching sessions for selected courses whereby the coach and the participants could interact and share progress on a given projects/assignments through online live video conference and discussion forum. DRM SG provides a very structured program design, qualified lecturers and mentors having PhD and industry experience, and solid ICT infrastructure to support the academic process, right from the beginning of the program. 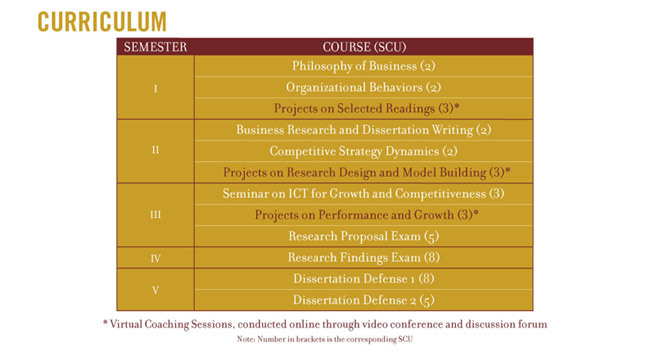 With these excellent combination of features and contents, DRM SG is committed to cultivating future business leaders and industry consultants, with dissertations containing original insights and implications, within 5 semesters.